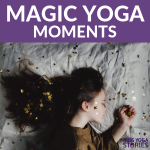 What is a magic yoga moment? And how do I experience one? Do you ever stop to ask yourself, “Why do I teach yoga to kids?” It’s a great question to reflect upon. Often, there is that one moment we’re trying to capture or go back to. That magic moment where you truly see the joy in a child’s eyes when they finally get themselves into … [Read more...] about What is a magic yoga moment? And how do I experience one?